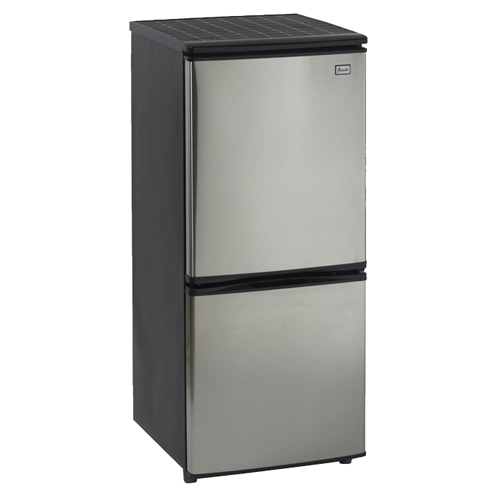 The Avanti FFBM45136SS 4.5 CuFt Bottom Mount Refrigerator is the ideal size for areas where space is at a premium. This Energy-Star Rated refrigerator provides convenient visibility and access to the freezer and refrigerator compartments. It has glass shelves, 2 clear vegetable crispers, and a pull out drawer in the freezer. At 44.5" tall and less that 2 ft. wide, this Bottom Mount Refrigerator neatly fits into nearly any kitchen and provides easy access to the user. It's great for apartments, condos, dormitories and even basements. Two Adjustable / Removable Glass Shelves>Two Removable Door Bins>Interior Light in Refrigerator Section>Energy Star Rated>Stainless Steel With A Black Cabinet This item cannot ship to APO/FPO addresses. Please accept our apologies.